Spring rolls: They taste great, are versatile for all diets, and inexpensive to make. Plus, they can be prepared from 90% fresh local products. Step 1. Buy spring roll wrappers from the Korean Market on Division for about $3 a pack of ~50 sheets. You can also by them from most chain grocery stores. They are made from tapioca flour, salt, and water. All ready you are winning over gluten free and vegan dieters. Step 2. Pick fresh vegetables or find them at a near by farmers market or produce store. I included shredded carrots, broccoli stems, green onions, and celery. Step 3. Grill up some Small Planet Extra Firm Tofu. I like mine cut into thin strips about one inch long. I also heat them in a pan until the outside is crispy and brown. You can also use any variety of meat if you don’t have tofu. Step 4. Soak the spring roll wrapper in boiling water. Use a plate and pour water in it, then soak the wrapper until it is soft. Remove the wrapper from the hot water and place it on a rolling plate. Step 5. 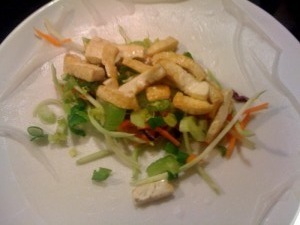 Fill the soft spring roll wrapper with the fresh veggies and grilled tofu. Roll up the wrapper like a burrito. Step 6. Get creative with dipping sauces. Take soy sauce and mix it with peanut butter and Piri Piri sauce. Or find your own variations. Fill the wrappers with fresh cut fruit and honey roll it up and you are ready to go. Do you recommend Spring Rolls? Make your voice heard!